DYNEOTM is the new temperature control solution from Julabo. Powerful immersion, heating and refrigerated circulators that deliver high standards in ergonomics, cost-efficiency, accuracy and precision. With great heating and cooling capacities, ranging from - 50° C to + 200° C, these circulators are perfect for demanding applications. Designed for user-friendly handling and operation, the DYNEO series feature an ergonomic, state-of-the-art turn & push controller, which is conveniently located on the front of the circulator head. This rotary knob allows not only for tactile verification of each step, but it also provides direct access to the menu for control of all functions and settings. Also, these units include a robust and bright TFT display, suitable for industrial environments, and very easy to read, even from a distance. The DYNEO incorporate pioneering technology with high-performance and high-quality components, featuring a wide range of modern data communication interfaces: USB, RS232 or analogue interface option. 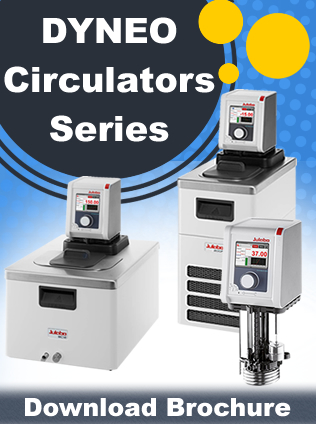 The DYNEO circulators have a large selection of models. Available for use in a closed loop or in combination with heating and refrigerated baths of different sizes and capacities, perfect for internal bath applications as well as external applications. What is the Circulator for Me? Get in touch with our Sales Team today to discuss the amazing abilities of this system. We can work together find the best circulator system for yuor applicaiton. You can also check out other heating and cooling solutions we have available on our webite.